We have just returned from a 5-week holiday to Israel (3.5 weeks) and Greece (1.5 weeks). We stayed with 4 different Servas couples in Israel and met 1 Servas couple (as day hosts) in Greece. All of the hosts were anxious to make us feel welcome. With each host we were able to see parts of Israel that many tourists would not see and to experience being in local neighborhoods at peak busy and non-busy times. We were pleasantly surprised to find that there were many choices for food in Israel. Also, that the food was Mediterranean in nature and very tasty. The food is very fresh and much is locally grown. Salads prior to a main are a selection of multiple dishes, such as tahini, hummus, baba ghanoush, lettuce/tomato/cucumber salad, eggplant, olives & etc. Fun, fun, and OH, SO VERY HEALTHY! By comparison, in the US, Kosher foods at many restaurants are corn beef or pastrami sandwiches with potato pancakes or chicken/matzah ball soup. Typical tourists who stay at hotels need to have breakfast early for long day tours. In Israel, as we found out from our Servas hosts, people have a late brunch, eat the main meal around 4 & then have a late snack prior to going to bed. I think many tourists did not get to enjoy the variety of foods that we did. 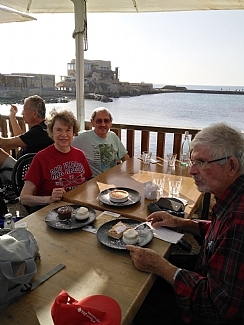 We had several excellent meals while we were in Israel. We discovered Shakshuka and other delicious egg dishes. When we arrived in Jerusalem, our Servas hosts drove us to the area where the UN maintains offices. Near these offices is a park with great views of the city. At one end of the park is a sculpture that is a tree split in two and the question is: Can this tree grow together again or will it remain separate”? We were in Tel Aviv when there was some military action in Gaza. One of the sons of the Servas family that we were staying with was home on leave from his military duty, but got called back to service. We found that people in Israel do not over react to these tense situations; we had comments that it may be safer in Israel than in the US with all of the associated intercity problems. We also discovered that the Government of Israel is very concerned for the safety of its citizens both because of the various military actions as well and maybe more importantly, protecting people and properties from earth quakes which occur on a 100-year basis. On Tuesdays and Fridays, the place to go in Tel Aviv is the Carmel Market (Shuk HaCarmel). This area contains several blocks of temporary vendor setups selling arts and crafts. We also went to one of the local markets in Ramet Gan on a Friday morning to participate in week end shopping and enjoying foods from the shops. It was interesting in the Haifa area that there are other cultures present such as the Druze and Bahai. In Greece our Servas contacts provided us with information about places to visit outside of the normal touristy places and introduced us to life in a small 5,000 population village, Galaxidi. We discovered that our Servas host was the one who designed the orange and green bird symbol that Servas uses for its logo. What a great couple! While we were in Israel, we found out that Servas International has a new web site program that is easy to use for finding hosts in most member countries. However, identifying US Servas members, could NOT be accessed at the time of our trip (October & November 2018). We assumed that this was an IT migration problem that hopefully will be resolved shortly. We had a great and memorable trip, thanks to all of our Servas Hosts.